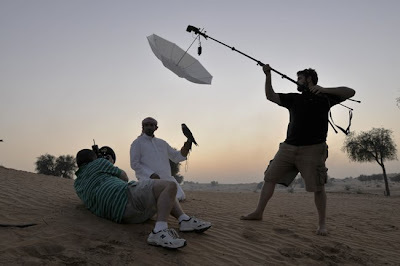 Pictured above is Joe McNally's assistant Drew Gurian acting as a voice-activated boom during a recent desert shoot (detailed here). While this boom is perfectly serviceable, one cannot always find a Drew hanging around in the desert when top light is needed. For the Drewless, an excellent and inexpensive speedlight boom solution, inside. The third cool thing I came across in Paso Robles (here is one and two) was a very slick little boom/stand photographer Sean Rolsen brought along. It is designed as a flex-reflector holder (it even comes with the clamps) but it does double duty as a sweet little speedlight boom. It is the Interfit Combi-Boom Stand, and the little joint where the stand turns into a boom is where the magic happens. The boom arm actually collapses into the main tubes of the stand itself -- you can even continue the boom arm straight up for extra height if you want. But if you pull it all the way out, it rotates. Then you slide it back into its little swivel clamp and you have a speedlight boom. It does not come with a counterweight, so this thing collapses nice and thin. But the opposite end of the boom has a hole where you can hook an improvised weight up to do the trick. A camera bag or something should fit the bill nicely. The combination pic below shows a detail of the boom joint, and how it operates. Looking at Sean's, it seemed just about perfect for lightweight speedlight use. But I would not consider it heavy duty by a long shot -- and I wouldn't put a lot of unnecessary torque on the clamp, either. There is no way you are gonna hang an AlienBee on this thing. A speedlight is about as far as it is gonna go. And it is gangly enough to not want to stick an umbrella up there in any wind at all. But for top light using speedlights in a nice, small package, it is hard to beat -- and an umbrella would be fine indoors. The elbow mechanism is pure genius, and the folks at Interfit are to be congratulated for that. (Those are the same guys who just debuted the "Strobies".) Also of interest is the price -- under $100.00. For lightweight, occasional boom use (and a stand when you do not need the boom) it appears to be a great solution.